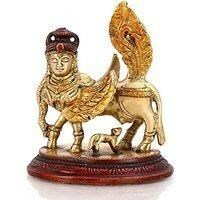 Kamadhenu, the sacred cow which grants all wishes and desires, is an integral part of Hindu mythology. This divine cow, which lives in heaven) emerged from the ocean of milk at the time of samudra-manthan (the great churning of the ocean by the gods (suras) and demons (asuras). It was presented to the seven sages by the Gods, and in course of time came into the possession of Sage Vasishta. Size : 4.5 Inches Height X 4 Inches wide X 3 Inches depth, Weight : 550 Grams, Material : Brass, Features:- Made from Quality Brass and Handmade in India.